Wisdom! 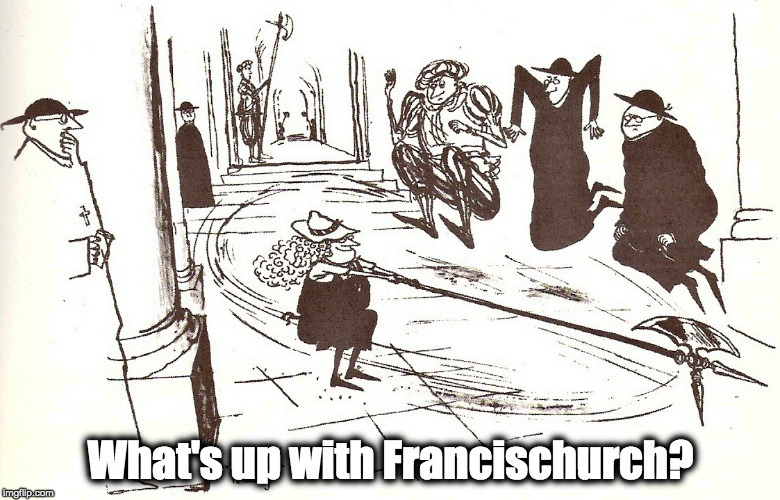 Let us be attentive – What's Up With Francis-Church? No, I’m not going Ortho. Not even going East within the Church. But I’ve maybe started getting a little more “ecumenical” in my sources for spirituality. The Norcia monks are BIG into the Desert Fathers and the early Fathers of the Faith. These are the guys whose trustworthiness has been beyond question for 1500 years or more. There are all manner of problems with Orthodoxy – most of them about politics and nationalism – but for the practice of the spiritual life, what prayer is and how to do it, we share the same sources. Their theology and ours match up to about the opening of the second millennium. I’m starting to see that diving deep into the Patristic sources for understanding Scripture is the way forward, and a lot of these Orthodox monks – many of whom appear a lot on YouTube – have got that stuff down pat. When people say things like, “We’ve got a lot to learn from the Orthodox,” this is where the truth of that statement lies. They have retained a devotion to the Fathers that we have in the main lost sight of. There isn’t one single reason that a Latin Rite Catholic can’t do the Deep Dive into these early sources of the Faith. And if you want to know what the Fathers of the early Church had to say about Scripture, take a look at this. These are the Scripture Commentaries compiled by Fr. Tadros Yacoub Malaty, a Coptic (Egyptian) Orthodox priest. These aren’t anything more than absolute, 100% pure Christian doctrine. The books (all Pdf) don’t contain much from Fr. Malaty himself – only some historical notes and background stuff to help understand context – but go line-for-line, verse-for-verse, through each of the books of the Bible giving what they mean from the greatest saints of the Church. If you want to do “Bible Study” this is the stuff you need. Here’s Fr. Malaty talking about how important the Patrology is. The accent is maybe a bit hard at first, but it rewards concentration. There is a richness and solidity to the original Church Fathers, the Patristic Doctrine that has not been equalled – in my personal opinion only, mind you – by any later scholars. Even great names like Thomas don’t come close to this in sheer usefulness for the pursuit of the interior spiritual life. For my money, Scholasticism may be great for, well, scholars. People pursuing degrees in theology can’t do better. But for us ordinary schlebs just trying to get through this Vale of Tears with our souls intact, the Summa is not the place to start.